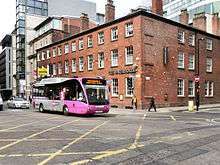 First Greater Manchester, is a bus operator in Greater Manchester. It is a subsidiary of FirstGroup. A timeline overview of public transport in Manchester, prior to 1993, is given here. Before deregulation in 1986, buses in the Greater Manchester area were publicly funded and went under the name of Greater Manchester Transport. In 1986 Greater Manchester Transport became known as GM Buses, which was owned by the metropolitan borough and city councils of Greater Manchester, but were at arms' length from the local town halls. In December 1993 GM Buses was split in two, GM Buses North and GM Buses South. 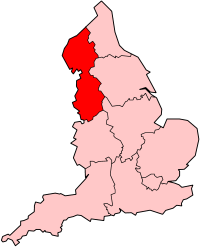 It was planned that the two companies would compete against one another, but in reality they stuck to the sides of Manchester as indicated by their names. In April 1994 GM Buses North was sold to a management buyout. By this stage many competitors were operating GM Buses routes following deregulation. 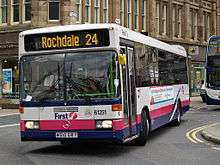 In March 1996 GM Buses North was sold to FirstBus and rebranded First Manchester. After a period of experimentation with the livery, an orange livery was adopted. First Manchester soon ended up managing two other FirstBus subsidiaries, First Potteries and First Pennine. That even included many GM Standard Leyland Atlanteans making their way to those two fleets. Eventually the First Pennine and Manchester subsidiaries were merged, adding a number of routes in the Tameside area to First Manchester. A new management team was put in place and First Manchester was relieved of its responsibility for the Potteries subsidiary. Various depots have been closed over the past 12 years including Atherton (1998), Bolton Crook Street (2004) (replaced by a new depot at Weston Street), Knowsley (2008), Rochdale (2004) and Trafford Park (2005) sites at Lowton, Bolton and Manchester Piccadilly have also been used temporarily for either acquired fleet (Lowton/Bolton) in 1998 or for the Commonwealth Games in 2002 (Manchester Piccadilly). As of September 2010 First Manchester has taken over the management of the Cheshire and Merseyside depots of First Potteries with the Staffordshire depots transferring to the management of the new First Midlands division. The Cheshire and Merseyside depots fell to a First Manchester licence. In February 2012, the company came under fire from Department for Transport North West's traffic commissioner after a performance survey found an average of 26% of First Manchester services were not running on time. The company were fined £285,000 in March 2012 for their poor reliability. In Spring 2012 First Manchester was rebranded as First Greater Manchester. 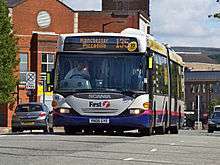 In June 2012, it was announced that FirstGroup were looking at selling off some of its operations, which included First Manchester's Wigan depot. On 2 December 2012, Stagecoach Manchester purchased the Wigan operation. The transaction saw 300 employees, 120 vehicles (although 20 were owned by Transport for Greater Manchester) and the Wigan depot purchased by the former A Mayne & Son legal entity. 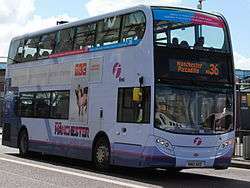 On 1 August 2013, FirstGroup announced that subject to regulatory approval by the Office of Fair Trading, it had agreed to purchase the bus operations of south Manchester based company Finglands Coachways. The purchase included the lease of Finglands's depot in Rusholme, South Manchester routes and approximately 100 members of staff, but no buses. The deal was approved on 27 January 2014 with First taking over Finglands services on 9 February 2014. The fleet over the previous years has been of interest and initially consisted on First's takeover of Dodge S56, Mercedes-Benz 709D and 811D and Iveco 59.12 minibuses, Dennis Dart, Volvo B6 and a solitary Volvo B6LE midibus, Leyland National, Leyland National 2, Leyland Lynx and Volvo B10B single-deck vehicles and Leyland Fleetline, Leyland Atlantean, Leyland Olympian, MCW Metrobus and Volvo Citybus double-deck vehicles. Most of the double-deckers were to the standard GMPTE body design with Northern Counties coachwork. Over the course of the early years the fleet had new vehicles introduced in the form of further Dennis Darts, Volvo B6-50s, Volvo B6LEs and new types consisting of the Mercedes-Benz Citaro O530, Optare Solo, Volvo B6BLE, Volvo B10L, Volvo B10BLE, Volvo B7L, Volvo B10LA and Scania L94UA. The policy was to swing away from buying any more new double-deck vehicles at this stage however second-hand vehicles came mainly from other FirstGroup subsidiaries or via takeovers, these consisted of further Mercedes-Benz minibuses; Volvo B10B, Scania L113CRL and L94UB, Volvo B10L, Volvo B10BLE and Mercedes-Benz O405 single-deckers; MCW Metrobus MKII, Leyland Olympian, Leyland Olympian tri-axle, Volvo Olympian, Volvo Citybus, Dennis Dominator, and Scania N112DRB and N113DRB double-deckers. Many of these vehicles have subsequently moved away including all Volvo B10Ls, most Scania L94UBs, all Volvo Citybuses, all Leyland Olympians and tri-Axle Leyland Olympians, all Dennis Dominators, all Scania double-deckers, some Volvo B10BLEs (some of these even came back again), all Volvo B7Ls (most of which had been purchased for use during the 2002 Manchester Commonwealth Games and were never used in normal service) and all Mercedes-Benz minibuses. 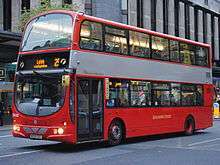 Withdrawals of Mercedes-Benz 0405s recently commenced as have withdrawals of Volvo B10Bs. All non-low-floor Dennis Dart and Volvo B6 midis have also been withdrawn and scrapped. In 2005 a start was made on renewing the fleet. Phase 1 involved the purchase of 256 Wright Eclipse Urban bodied Volvo B7RLE saloons and 18 Scania CN94UA OmniCity articulated buses. These were delivered throughout 2005 and 2006. In 2007 a fleet of 36 Volvo B9TLs with Wright Eclipse Gemini bodywork followed. These were the first new double-deckers for some years. In 2008 a new Phase commenced of replacing Volvo B7RLEs bought in 2005 and 2006 along with about 100 older saloons with 110 Volvo B9TLs with Wright Eclipse Gemini bodywork over a two-year period of 2008 and 2009, expected in 2011/2 are a fleet of 14 Wright Gemini 2 bodied Hybrid Vehicles for new cross city route 18 From Rusholme (Manchester Royal Infirmary) to Langley. Over the years several fleets have been taken over; these have included Timeline Travel (Leigh) (North GM Area Bus Operations), Pioneer (Rochdale) (Bus Operations), Coachmasters (Rochdale) (Bus Operations) as well as the transfer of First PMT's Dukinfield fleet to First Manchester control. As at March 2016, the fleet consisted of 687 buses and coaches. Over half are Volvos. First Greater Manchester followed the lead of Travel West Midlands in using low-floor articulated buses with the delivery in 1998/99 of 15 Wright Fusion bodied Volvo B10LAs. These were initially used on route 135 between Manchester and Bury, these then transferred to Bolton and have been used on route 8 Bolton - Manchester and more recently on route 582 Bolton - Atherton - Leigh. Their introduction on the 582 was somewhat controversial, with users claiming that the reliability and frequency of the service had suffered. In April 2009 these Volvo artics were placed into storage, with the possibility of them being cascaded within FirstGroup. In 2005, 18 Scania OmniCity articulated buses arrived to take over operation of route 135. A single Wright Solar Fusion bodied Scania L94UA articulated is also owned and was again initially used at Bury but has been used since on routes 8 and 582 from Bolton. It is now reallocated back to Bury. The Wright Eclipse Gemini is now the most numerous vehicle type in the fleet. The first 36 were delivered in 2007 followed by a further 110 of a similar type in 2008/09. These are mainly used on routes 8, 17/18, 33, 36/37, 41, 42, 59, 67, 83, 100, 135, 162/163, 180/184, 350, 409, 471 and X34. First Manchester also have 14 Hybrid buses, which mainly serve the red 17 and 18 overground routes between Manchester and Rochdale (17) and Manchester and Langley (18) via Middleton. Beginning in August 2012 First Greater Manchester took delivery of new Alexander Dennis Enviro 400 vehicles which operate on routes 8, 36/37, 41, 42, 83, 180, 184 and 409. Previously when the company first started in 1996, the standard fleet for double-deck buses where Standard Atlantean metrobuses from the early 1980s which were prominent in the Manchester area before First Manchester existed, as well as the Northern-Counties bodied metrobuses which GM Buses had since 1986, and they would be a mainstay in the fleet. These buses were pulled out of service when they were becoming 20 years old. Wright Eclipse bodied Volvo B7RLEs delivered in 2005/06 form the majority single-deck type, although about 40% of the original 256 have already been cascaded to other FirstGroup fleets. Other low floor types present in significant numbers include Wright Renown bodied Volvo B10BLEs and Mercedes-Benz Citaros, as well as a number of Alexander Dennis Enviro 300s and Wright Streetlites. Also operated are a fleet of Vehixel bodied, Iveco Scolabuses that are operated from Dukinfield and Ince Depots on behalf of TfGM who also own these vehicles. These are primarily Plaxton Pointer or Marshall bodied Dennis Dart SLFs operated out of Oldham and Ashton depots. A small fleet of minibuses is operated on Metroshuttle contracts and one or two other routes based on Manchester, Oldham and Dukinfield depots. The entire minibus fleet consists of Optare Solo integral models. The support fleet is quite a varied one and consists mostly of Volvo B10B/B10BLE driver training buses with Wright Endurance/Renown bodies. A large fleet of vans and pick-ups are operated, these are usually Vauxhall Combos or Corsas (smaller vans) or Ford Transits (bigger vans and pick-ups). Also owned are various fork lift trucks, and garage floor cleaning equipment known as 'Floor Scrubbers'. First Greater Manchester mainly run services in central Manchester and the northern area of Greater Manchester including Oldham, Rochdale, Bury, Bolton, Tameside and Salford. First also operate services in the Wigan area, although following the sale of the Wigan depot to Stagecoach Manchester in December 2012, First only serve Astley, Atherton, Leigh and Tyldesley, which are served by routes 12, 25, 26, 39, 582 and X34 (jointly operated with Stagecoach) from their Bolton and Manchester depots. From February 2014, First started operating services in the southern half of Manchester following the purchase of the depot and services from Finglands. First Greater Manchester operate the three Metroshuttle services that operate around Manchester city centre. These services are free for passengers. On 3 April 2016, First Greater Manchester commenced operating services on the 4.5 mile North West Guided busway between Leigh and Ellenbrook under the Vantage brand. First Greater Manchester originally branded their frequent services as an Overground. Based on the London Underground network where each frequent service is given a recognisable colour, each Overground service was also allocated its own colour line. The concept was a prominent fixture on network maps and coloured vinyls applied to the buses frequently serving those routes. However, the brand has largely been dropped. The colours still remain on network maps but the vinyls for the most part have disappeared from the fleet's vehicles. The coloured routes are those with Monday - Saturday daytime frequencies of 15 minutes or better. This has allowed services such as the 67, 98, 519, 540 and 598 to keep their coloured line despite the frequency of the service dropping under the 10 minutes minimum frequency. Usually, the colours are allocated randomly. However, the 180/184 was allocated the Purple line when the services was made into an Overground route in 2004 and the 184 was extended to Huddersfield replacing service 365. The extension also saw the 184 service incorporated into the Huddersfield Overground with services 348, 350 and 352 (which was later re-numbered 181, 182, 183 and 185 to fit in with the 184) already branded as the Purple line (as had the 365 previously). Due to ongoing fleet modernisation most Overground services are currently unbranded, with only the 36/37, 180/184, 409, 471 and 582 having significant route branding. Route 100 was previously branded as "unmissable", route X34 branded as "Spinning Jenny" and route X35 as "Flying Shuttle", rather than with a colour line. In 2013, First Greater Manchester repainted eight buses into the liveries of former transport companies to create a heritage fleet across their operating areas, which acknowledges the preceding companies that would eventually become First Greater Manchester. Three Volvo B7RLEs were painted into the liveries of Bolton Corporation Transport, Oldham Corporation and Ramsbottom Urban District Council, while five Volvo B9TLs were painted into liveries of Bury Corporation, Manchester City Transport, Rochdale Corporation, Salford City Transport and Lancashire United Transport. In Spring 2006, First Manchester re-routed its 67 service between Cadishead and Manchester to run direct along Liverpool Road during the day. This was designed to speed up the service running between Eccles and Cadishead. As a result, buses were withdrawn from running via Merlin Road and surrounding areas in Irlam. To help passengers, First introduced OvergroundLink, which is described by First as a feeder service. The 67L service, which uses a small bus or vehicles with low floor access for wheelchairs and pushchairs, runs a clockwise circular service from the White Lion pub on Liverpool Road, running via Cutnook Lane, Merlin Road, Morillon Road and Silver Street, returning to the White Lion, where the service connects with the 67. The service takes 5 minutes to complete its route and runs Mondays to Saturdays with a frequency of every 10 minutes from 06:40 (08:00 on Saturdays) until 19:00. This service was the first one introduced by First and ran until 2010 when it was replaced by the 100 service. Other attempts were not so successful. Another 67L service was introduced in July 2006 to serve the Brookhouse estate. The service was designed so that passenger could board or alight the bus at any point along the route in Brookhouse, also known as 'Hail and Ride' before alighting the service at the Unicorn pub in Peel Green to connect with the 67. This service was withdrawn in January 2007. The main reason for the service not succeeding is probably down to the fact that the estate is served by the 10, which was run by First, and the M10, which was run by Arriva. Both services run services from Brookhouse to Manchester without the need to change buses, the M10 has been withdrawn and the 10 is now run by Arriva, there is also an early morning and night service 63 operated by First. Another OvergroundLink service was introduced in July 2006 and withdrawn in January 2007 was the 98L. This was designed to link up with the 98 service running between Bury and Manchester on Bury New Road at the junction with Butterstile Lane. The 98L would operate around the Carr Clough area using Hail and Ride. Like the 67L Brookhouse service, the 98L was probably withdrawn because another service already links Carr Clough and Manchester, the 93 which ran between Bury and Manchester now it only runs between Carr Clough and Manchester. In April 2007, First introduced the 598L, which was introduced when First replaced its 593 daytime service with a new Overground route, the 598. However, while the 593 ran via Castle Hill and Belle Green, the 598 runs direct between Hindley Green and Wigan. Castle Hill was still served by the 540, whose frequency increased from every 30 minutes to every 10 minutes and the 32 was re-routed to serve Castle Hill, the 598L was withdrawn in 2009 and replaced by rerouted 598 buses directly serving the Estate. 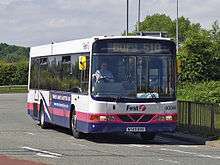 In May 2007, First introduced another 67L service in Irlam. Starting at the White Lion, the service runs via Fiddlers Lane, Mond Road, Princes Avenue, Addison Road and Liverpool Road to the White Lion. The service was re-routed at the end of July 2007 to run via Boundary Road instead of Princes Avenue and Addison Road. This route was withdrawn at the end of August 2007. Another 67L route was introduced on 2 September 2007 running via Liverpool Road, Vicarage Road, School Lane, Parkston Road, Cutnook Lane and Silver Street. In August 2008, service 67L was extended to serve the local Tesco superstore in Irlam with buses running to the store between 9.45 am and 2.45 pm, whilst reducing the number of journeys running around Irlam from every 10 minutes to every 30 minutes. The link was withdrawn in January 2010, when the 67L was withdrawn and replaced by a re-routed 100 service, which would cover the route. The withdrawal saw the end of the Overground Link services. First Greater Manchester offer several night bus services in Manchester every Friday and Saturday night to help people get home from a night out. The routes are mainly the same as the normal routes with some exceptions. Services 8, 17 and 67, which during the day start from Shudehill Interchange, start their journeys from Piccadilly Gardens. Services 82 and 135 leave from different stands in Piccadilly Gardens, with the 82 leaving from stand D instead of stand A, while the 135 leaves from stand N instead of stand E. The 135 also serves Shudehill, which it doesn't do during the day, while the 67 doesn't serve Shudehill. The services run every 30 minutes or every hour from midnight to 3am. The fare system on the night bus services is different from the normal fares offered by First, as there is only a flat fare offered. For passengers travelling from Wigan, the price is £2.00 while in Manchester, it is £3.00. A FirstNight ticket is priced at £4.00 for passengers who uses the Nightbus in both directions. Until December 2012, First also operated the Nightbus network in Wigan town centre, providing a number of services to the various area in the Wigan area plus the 598 to Leigh, which allowed connection with the 39 to/from Manchester. The services were mainly a replicated route of its normal services with a few exceptions. The 600 normally runs from Wigan to Leigh while the night bus runs a circular service to Ashton-in-Makerfield before returning to Wigan via Platt Bridge. The 629 Nightbus service was based on the former daytime service between Wigan and Castle Hill. The 631 & 632, which normally run circular services from Wigan to Highfield Grange are re-routed to serve Pemberton and Hawkley Hall. The 635, normally run by South Lancs Travel from Wigan to Shevington Vale, while First's night bus service 635 runs a circular service to Shevington, Shevington Moor and Standish. The 695 service, which was not based on any First route, ran to Upholland along Arriva North West's 375/385/395 route. First also ran Arriva's 362 service to Standish & 385 service to Orrell and Maytree Travel/Wigan Buses service 612 to Wrightington Hospital on New Year's Eve evening. From 2 December 2012, the Wigan Nightbus network passed to Stagecoach Manchester with First Manchester's Wigan business. Mid Spring 2016, saw the number 8N withdrawn due to poor passenger numbers. The withdrawal received a poor reception from Bolton Liberal Democrat Campaigners who insist the service was a "necessity". Due to a reduction of traffic on the roads of Greater Manchester during the summer holidays, First Greater Manchester changed some of the timetables on busier services. The period that the summer timetables are introduced coincide with the school summer holidays, starting in mid-July and ending in late-August/early-September. Usually, buses are re timed to run to similar times to the off peak timetable, while some service introduce additional journeys, as buses that would be used for school services are made available. ↑ "Bus firm First slammed by transport watchdog over unreliable services". Manchester Evening News. 7 February 2012. Retrieved 4 April 2012. ↑ "Bus firm First fined £285k by transport watchdog after one in four services run late". Manchester Evening News. 13 March 2012. Retrieved 4 April 2012. ↑ "First seeks buyers for seven bus operations". Passenger Transport. 28 June 2012. Retrieved 3 November 2012. ↑ McCollom, James (31 October 2012). "Stagecoach to acquire First routes in Wigan". Manchester Transport. Retrieved 3 November 2012. 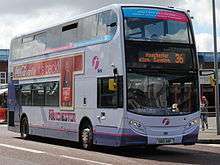 ↑ "FirstGroup plc Agree To Acquire Finglands Bus Operations In Manchester". First Group. 1 August 2013. Retrieved 1 August 2013. 1 2 "PRESS RELEASE - First given OFT approval to acquire Finglands bus operations in Manchester". First Group. 27 January 2014. Retrieved 9 February 2014. 1 2 "First take over Finglands bus services". Transport for Greater Manchester. 7 February 2014. Retrieved 9 February 2014. ↑ "Finglands bus services". First Group. Retrieved 9 February 2014. ↑ "First Manchester High Frequency Network map" (PDF). First Group. Retrieved 23 January 2010. ↑ "Heritage Buses". First Group. Retrieved 9 February 2014. ↑ "First Manchester New Year Eve Evening and Night Bus Service" (PDF). First Group. Retrieved 30 November 2010.